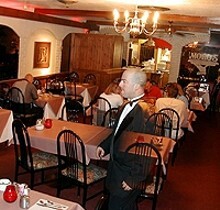 Moro's is somewhat of a time-warp - including the fact that they offer old-fashioned (tuxedoed) professional service. Most entrees cost around $18 and include everything from soup to nuts. Owner Thomas Moro butchers his own veal, the specialty of the house included in 10 different dishes. with bolognese or marinara sauce.